Wyeth garnered major acclaim with his 1948 piece, "Christina's World," showcasing a friend of Betsey's who had been stricken with polio making her way across a field without a wheelchair. He became known for both vivid landscapes and portraiture, sometimes fusing the two. Other works among scores included "Trodden Weed" (1951), "Up in the Studio" (1965; featuring his sister Carolyn), "French Twist" (1967), "The Clearing" (1979) and "The Carry" (2003). Many of Wyeth's subjects were neighbors and locales in his surrounding area, as he generally kept close to home. Wyeth became famed for the quality of realism and detail found in his art, often creating moody pastorals, while also being blasted by some critics for his lack of avant-garde cred. Nonetheless, exhibitions of his art, which were shown internationally, often brought in record numbers of museum visitors. 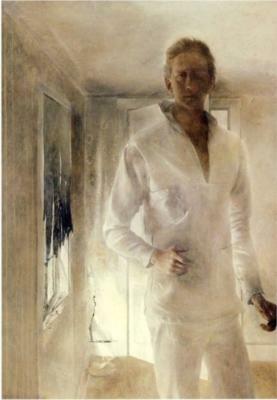 Wyeth also went on to receive many honors. He was awarded the Presidential Medal of Freedom in 1963 and later received the Congressional Gold Medal in 1990 from President George H.W. Bush, the first artist to receive the award. In his art, Wyeth's favorite subjects were the land and people around him, both in his hometown of Chadds Ford, Pennsylvania, and at his summer home in Cushing, Maine. Wyeth often noted: "I paint my life." One of the best-known images in 20th-century American art is his painting Christina's World, currently in the collection of the Museum of Modern Art in New York City. This tempera was painted in 1948, when Wyeth was 31 years old. Andrew was the youngest of the five children of illustrator and artist N.C. (Newell Convers) Wyeth and his wife, Carolyn Bockius Wyeth. He was born July 12, 1917, on Henry David Thoreau's 100th birthday. Due to N.C.'s fond appreciation of Henry David Thoreau, he found this both coincidental and exciting. N.C. was an attentive father, fostering each of the children's interests and talents. The family was close, spending time reading together, taking walks, fostering "a closeness with nature" and developing a feeling for Wyeth family history. Andrew was home-tutored because of his frail health. Like his father, the young Wyeth read and appreciated the poetry of Robert Frost and the writings of Henry David Thoreau and studied their relationships with nature. Music and movies also heightened his artistic sensitivity. One major influence, discussed at length by Wyeth himself, was King Vidor's The Big Parade. He claimed to have seen the film, which depicted family dynamics similar to his own, "a hundred-and-eighty-times" and believed it had the greatest influence on his work. Vidor later made a documentary, Metaphor, where he and Wyeth discuss the influence of the film on his paintings, including Winter 1946, Snow Flurries, Portrait of Ralph Kline and Afternoon Flight of a Boy up a Tree. Wyeth's father was the only teacher that he had. Due to being schooled at home, he led both a sheltered life and one that was "obsessively focused". Wyeth recalled of that time: "Pa kept me almost in a jail, just kept me to himself in my own world, and he wouldn’t let anyone in on it. I was almost made to stay in Robin Hood's Sherwood Forest with Maid Marion and the rebels." In the 1920s, Wyeth's father had become a celebrity, and the family often had celebrities as guests, such as F. Scott Fitzgerald and Mary Pickford. The home bustled with creative activity and competition. N.C. and Carolyn's five children were all talented. Henriette Wyeth Hurd, the eldest, became a well-known painter of portraits and still lifes. Carolyn, the second child, was also a painter. Nathaniel Wyeth, the third child, was a successful inventor. Ann was a musician at a young age and became a composer as an adult. Andrew was the youngest child. Wyeth started drawing at a young age. He was a draftsman before he could read. By the time he was a teenager, his father brought him into his studio for the only art lessons he ever had. N.C. inspired his son's love of rural landscapes, sense of romance, and artistic traditions. Although creating illustrations was not a passion he wished to pursue, Wyeth produced illustrations under his father's name while in his teens. Artworks of Andrew Wyeth are removed from WikiArt due to a copyright infringement notice. Apples on a Bough, Study Before Picking, ? Bird In The House, ? Corner of the Woods, ? Jim Hawkins Leaves Home, ? Love in the Afternoon, ? Man and the Moon, ? Maud Cook (Mrs. Robert C. Reid, ? Tomorrow The Outer Shoals, ? Up in the Studio, ? Wild Dog (study for groundhog day), ?